Why teak wood furniture is popular? 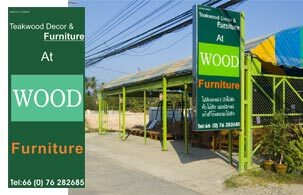 Wood Furniture reputation for excellence in manufacturing and making to order superior wood and emphasize on teak furniture (Outdoor- Indoor furniture, Door panel, Window panel…) has secured our position as the premier outdoor authentic wood furniture company in Phuket. Using only the finest quality teakwood, our expert craftsmen individually handcraft all premium teak furniture right here in Wood Furniture Phuket. Moreover we have oversea delivery service. Our products are made with Grade A wood. We do not use lesser grades, nor do we try to hide or fill imperfections. For one simple reason – our wood doesn’t have any imperfections. Knots, white and dark wood areas are removed from our wood and teak. Open Daily 8.30 am. - 6.30 pm.